* Split grid settings (left column, after clipboard stuff) into two files -> one for standard maps, another restricted one for tile maps. * Export XML tilemap planes as <plane> elements, not <floor>. Update export ref pdf. * Update input quick reference in distro. Last edited by David Walters on Jan 21, 2017 11:52, edited 10 times in total. Hoping to release v4.03 soon, sorry for the delays. The number of little gotchas that adding clipped grids have thrown up has been quite unexpected. 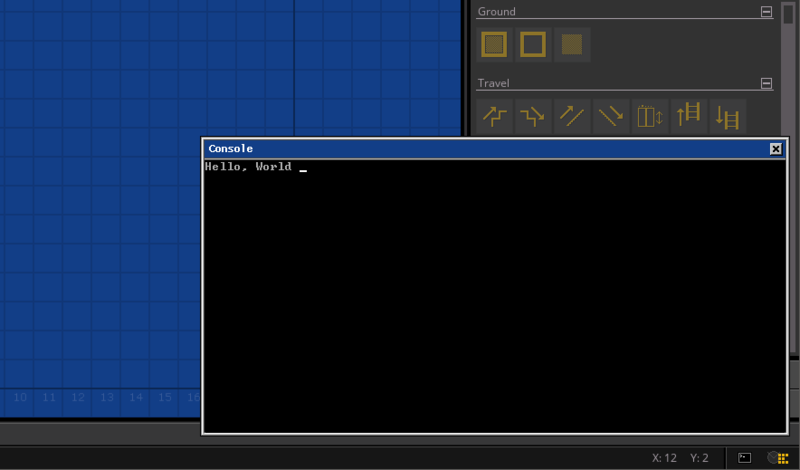 As part of v4.0.3 development I've updated the XML export code to handle tilemaps. I've updated the export reference manual to match. Last edited by David Walters on Jan 18, 2017 18:26, edited 1 time in total. * Clipboard functions on hexagon H and V type grids do not fully support clipping. Tile edges that are colinear with marquee edges may be read from /written to outside of the clipped grid area. These stray edges can be seen by using the nudge function to move the area back into the visible area. * Stroke on Hex-H and Hex-V grids does not respect grid clipping. As you hopefully agree, these aren't too severe and addressing them at a later date won't be too inconvenient. v4.0.4 is underway! One of my goals for this release is to work on 'quality of life' improvements for workflow weaknesses that have been reported to me. I greatly appreciate whenever someone takes the time to report problems they've encountered, even little niggles, so thank you! 1. Added new option "Theme Changes Apply to All Regions" to the setup > display menu. This speeds up changing the theme for your whole map as it turns it into a one-click action. 2. The clipboards are now no longer fully cleared when starting a new map. Now only custom tiles are removed from the clipboard (which at this time is unavoidable, sorry) leaving any stock brushes preserved, similar to how v4.0.2 worked. 3. Remember the last selected theme and apply it to new maps. (Tile maps will still always default to plain grey). So you can now change to parchment once and not need to do that again if you choose. I'm also about 1/3rd of the way through the Game Link chapter of the manual. I intend to improve that experience for the next version as well so the writing and the coding leap-frogging one another right now. Last edited by David Walters on Feb 06, 2017 09:51, edited 4 times in total. One of the most common support issues I get are related to the kinda unfriendly experience you get when trying out Game Link for the first time. Even though it's far less complicated than in v3, there's clearly room for improvement. To this end, I've added a little 'assistant' feature that offers to help the user with switching to split screen view and to create a compatible map for the game they're playing. I've begun work on scripting support. For now this will be extend only to allowing the Pro edition to export data to arbitrary file formats. As a test project I'm working on a CSV export for tile maps. Future scripting could get more complex but as a first step this seems like a useful feature on its own. Last edited by David Walters on Feb 07, 2017 00:39, edited 3 times in total. Work hasn't stopped on GC404 while all this greenlight stuff is happening. Today I added support for generic radio button message boxes. I used it to beef up the Floor > Clean (mop icon) command with a new 'remove all the colors from the floor' button. Is there anything else you'd like to be able to remove from a floor in one fell swoop ? Right now I'm finishing up v4.0.4 by working on scripting features for the Pro Edition. To help me with that I've added a suitably retro looking console window. This is mainly useful to me as a way of assisting my development as it gives me somewhere nice to put error messages and suchlike. In future I expect I'll extend the console to add more technical features that might be of use to the interested user, but I don't intend for it to be a requirement - Grid Cartographer is meant to be user friendly and the graphical interface should be all you need to operate its core features.